Description William T. Walters commissioned this painting in 1863, but the artist did not deliver it until 20 years later. In a letter to Walters, Gérôme identified the setting as ancient Rome's racecourse, the Circus Maximus. He noted such details as the goal posts and the chariot tracks in the dirt. The seating, however, more closely resembles that of the Colosseum, Rome's amphitheater, in which gladiatorial combats and other spectacles were held. Similarly, the hill in the background surmounted by a colossal statue and a temple is nearer in appearance to the Athenian Acropolis than it is to Rome's Palatine Hill. 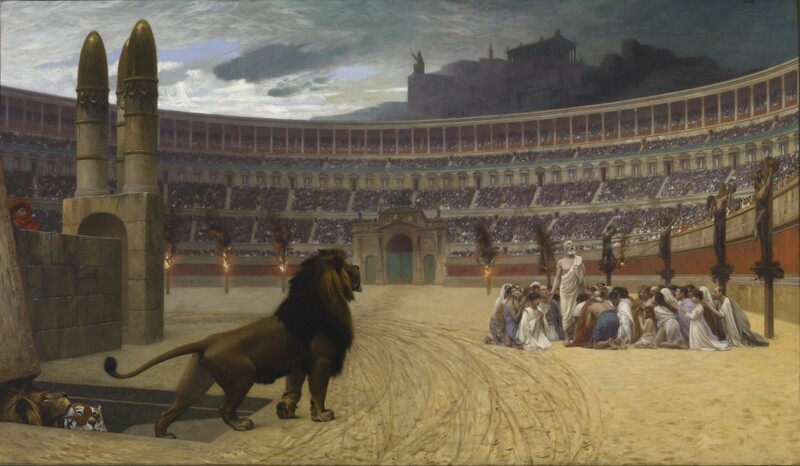 The artist also commented on the religious fortitude of the victims who were about to suffer martyrdom either by being devoured by the wild beasts or by being smeared with pitch and set ablaze, which also never took place in the Circus Maximus. In this instance, Gérôme, whose paintings were usually admired for their sense of reality, has subordinated historical accuracy to drama. W. M. Brady & Co, New York, in "Drawings and Oil Sketches 1700-1900," 27 January 2009 - 12 February 2009, No. 21, offers "Study for the 'Death of Caesar," an oil on canvas with pen and ink underdrawing, measuring 7 5/8 x 13 in. (19.5 x 33 cm), which formerly belonged to Maurice Aiccardi, Paris. This sketch may be the one that Theophile Gautier alluded to during a visit to the artist's studio in 1858 (G. Ackerman, Jean-Leon Gerome: Monographie revisee 2000, pp. 240-241). J. L. Gerome. Dayton Art Institute, Dayton; Minneapolis Institute of Art, Minneapolis; The Walters Art Gallery, Baltimore. 1972-1973. Romans and Barbarians. Museum of Fine Arts, Boston, Boston. 1976-1977. Provenance Comissioned by William T. Walters (through George A. Lucas as agent), Baltimore, May 2, 1883  (received in 1883 from the artist); inherited by Henry Walters, Baltimore, 1894; by bequest to Walters Art Museum, 1931. The Diary of George A. Lucas, p. 563.